After going through the Yimen Gate, one can see the Dacheng Hall standing in the middle of the broad stone courtyard. According to ancient etiquette, the various officials involved in the Confucius ceremony would stand in certain positions on the granite floor. This gives the ceremony a very solemn appearance. The Dacheng Hall is the main building of a Confucius temple, and the tablet of Confucius is placed here. The tablet is placed on a very high platform with steps leading up to it. In front of the Dacheng Hall is a platform called the Dan Chi, where, during the Confucius ceremony, the musicians stand and young boys dance the six-fold formation dance. In front of the Dan Chi there is the imperial road, on which is carved the cloud dragon, whose spirit is well shown by the delicately carved head. 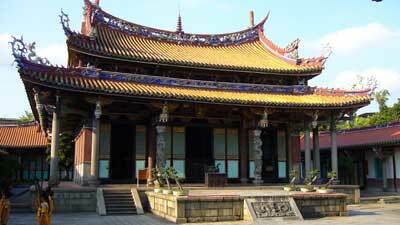 The Dacheng Hall is as wide as five normal-sized rooms, as deep as six normal-sized rooms, and has 42 huge pillars. It has a double-eaves style roof. There are corridors on all four sides, and you can walk around the hall along the winding corridors. This grand and carefully designed structure is one of the few traditional buildings in Taiwan. The carved stone pillars used in the corridor are all made of Quan Zhou white stone. In the middle is a pair of coiled dragon pillars. The carving is very fine and the pillars are considered to be masterpieces. All these carvings are the work of craftsmen from Huian, Quan Zhou. The style is powerful and simple, very different from the ornate style used in most temples. Look at the ridge of the Dacheng Hall, you will find there is a seven-storey pagoda in the middle, a cylinder-like object on the swallow-tail eaves at both ends, and 72 clay owls on the roof ridge. All these decorations have their origins and stories. According to the legend, the pagoda symbolizes the suppressing of evil; therefore a small pagoda was placed in the Dacheng Hall. The cylinder-like object, known as a Tong Tian Pillar, is put on the body of a sea-tortoise. There is also a coiled dragon on the cylinder. It is said that during the Song Dynasty, Zhu Xi remembered with gratitude that Confucius was the model of perfection, and put a Tong Tian pillar in the roof of the Quan Zhou Confucius Temple to show his respect. It later became a tradition in the Confucius temples of Southern Fu Jian. Another story is that Shih-huang-ti, the first emperor of Chin, burned the books and buried the scholars alive. In order to preserve books, scholars hid them inside bamboo. To commemorate the protecting of books, Tong Tian pillars were put on the ridge. The Tablet of Confucius is placed in the sanctuary in the middle of the Dacheng Hall. The black tablet on which President Chiang Kai-shek wrote in gold: "Education for All" is Hong up. On the left and right walls are the tablets of "Fu Saint" Yen Tzu, "CHong Saint" Tseng Tzu, "Shu Saint" Tzu Szu, the "Lesser Sage" Mencius, and the Twelve Philosophers. The Da Cheng Hall is very spacious and solemn. Above the hall is an octagonal plafond, and there are 24 brackets concentrated in the center. After four layers of eaves brackets, there are only 16 brackets left to the top in a radiation shape, which is very magnificent. In the four corners of the plafond there are four bats carvings (four bats in Chinese is a homonym for "giving fortune"). In addition, there are sloped carved ceilings on the two sides of the plafond. These ceilings cover the beams but also allow ventilation. This combination of decorative and practical use makes one admire the cleverness of ancient Chinese architecture.